"Everytime you sin, you pound the nail further into the hands of Jesus." 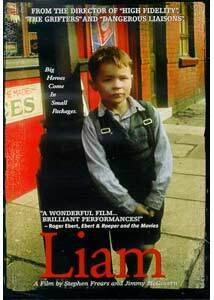 The title character in Stephen Frears' Liam is a young boy living among the Irish immigrants in Liverpool in the 1930's. He's Catholic, which may put him at a disadvantage�when asking for a job from a woman she fears is a Protestant, Liam's sister is quick to lie; she's so desperate for work, she denies her religion. Desperate is the word for Liam's family. His father, played by character actor Ian Hart, has worked for years in a factory that has just shut down. His mother (Claire Hackett) scrimps to pay the rent to their landlord, a Priest who patronizes them when they can't make rent. Liam, shy and quiet, probably due to the debilitating stutter he develops when he is around others, is told at school that every time he sins, he beats the nails deeper into Jesus' hands�his teacher, harsh and brittle, could not be farther from the image of a benevolent, Godly love. Liam is terrified for his soul, worried about blame and when a sin is a sin. His father, meanwhile, absolves himself of blame. He knows he is out of work because of the Jewish factory owners and the Irish factory workers who steal all of the jobs. Liam is a lyrical, sometimes painful portrait of a family struggling in difficult times. I was reminded of Angela's Ashes�Frank McCourt's family may have been Irish, but the same pains, the same ache of poverty, the same afflictions of the soul run through Liam's household. Frears' elegant direction captures moods without a word, with warm, lush tones in happy times quickly leeching away to icy blue-filtered reality. Anthony Burrows is Liam, an earnest boy who carries the weight of the world in his eyes. It's a remarkable performance, childlike but not carefree. During his first confession, Liam gets tongue-tied before the words suddenly come to him in a rush, and Burrows' relief at finally getting something to come out of his mouth right is remarkably genuine. Hart, meanwhile, carries with his the core of the film. Dad is a proud man�when desperate for work, he bribes a foreman with a pint, and then spits in the man's face when he is passed over anyway�unwilling to admit failure and disappoint his family. He blames socialists for the downfall of the economy, and we see how easily he accepts fascism, a simple philosophy that makes it easy for him to rid himself of guilt and blame. The stories of Liam and his father run parallel, as both struggle to deal with blame in their own lives. Liam turns to religion, which his teachers have convinced him is the only thing that will save his soul. His father, whom religion has failed, turns, in the end, to terrorism. Both do what they do out of guilt and remorse. Beaten down, they may never find true salvation. Image Transfer Review: Liam used shifting colors palates throughout, from lush, warm tones to cold, icy blue, and Lion's Gate has produced a transfer that preserves these artistic flourishes remarkably well. Colors go from muted to saturated, as the scenes demands. There is a bit of visible grain throughout, and it shows up a bit more in darker scenes, but it appears to be an effect of the shooting style and not a fault of the transfer. I didn't notice any artifacting or aliasing, but slight ringing is visible in brighter scenes, indicating edge enhancement was used to sharpen the slightly soft image. Audio Transfer Review: I'm unclear as to whether Liam played in theaters with a 5.1 mix, but only a 2.0 track is included on the DVD. It isn't bad�dialogue is always clear, and the score is reproduced with good fidelity�and it isn't exactly the kind of film that cries out for a good mix. A bit of directionality here and there spreads out the front soundstage, but for the most part, this is pretty plain material. Extras Review: The only extras offered are subtitles in Spanish and English and a trailer gallery with clips for the feature, Amores Perros, and Lost and Delirious. Liam probably went unnoticed by many during its limited art-house run in late 2001. It's a shame, because the picture is a real gem, a bittersweet story of a family unable to change along with the world around it. Lion's Gate has given the film a lush anamorphic transfer that almost makes up for the lack of supplemental features.